I made this cake from 4 Mini Loaf pan cakes. I cut 2 of them in half, frosted 3 of the halves to make the cars, used a whole one and cut pieces from the the 4th half to make the engine. I used mini chocolate sandwich cookies for the wheels. I wrote Happy Birthday and #1 and the top of the train cars. I'm attempting this today for my 2 year old grandson! 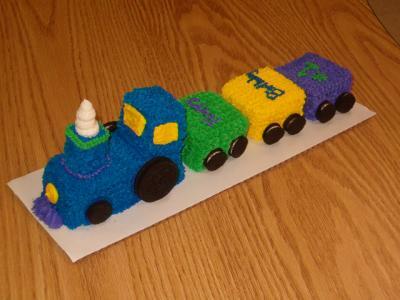 This is a great train cake and it sounds like it is easy to make too. Great job and thanks for sharing!